Victorian greenhouse - Who Has The Best? A Victorian greenhouse is a timeless classic that looks as good in the garden today as it did over a hundred years ago. Of course, today’s Victorian greenhouses take their style inspiration from the nineteenth century glasshouses, but make them even more practical and affordable thanks to the use of modern materials and manufacturing processes. 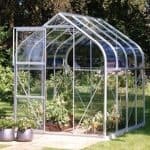 If you’re looking for a high quality, eye catching greenhouse for your garden then check out this Whatshed guide to the very best Victorian greenhouse that can be bought online in the UK today. All of the greenhouses featured in this list had to have taken some inspiration from the classic Victorian greenhouse design, which means that they all feature timber boarding in some form or other. We then looked at the cost and value for money of each greenhouse, as well as their aesthetic appeal and durability. Many of the leading garden building retailers specialise primarily in cost effective plastic greenhouses, with models by companies such as Palram still providing a high quality growing solution. That’s why there are no models from retailers such as Wickes and Homebase in this league table. We were pleased to find fifteen high quality models that were deserving of a place however, and that evoked the Victorian style either through their symmetry and timber boarding, or in one case an ornate yet traditional hexagonal design. In what has been a very competitive and diverse category, it’s well done to the nine foot by six foot Ultimate half boarded greenhouse which is named as the best Victorian greenhouse available online in the UK today. It achieves this by offering relatively good value for money, and by being very tough and durable with a long extended warranty period. For greenhouses, garden sheds and more, WhatShed bring you the independent reviews that can help you make a perfect choice. A high quality Victorian greenhouse will typically cost more than the plastic and aluminium greenhouses that are becoming increasingly prevalent, and yet for many people that’s an investment well worth having. This Ultimate half boarded greenhouse is a perfect example of why sometimes it can be worth paying a little extra for something that offers obvious quality and elegance. 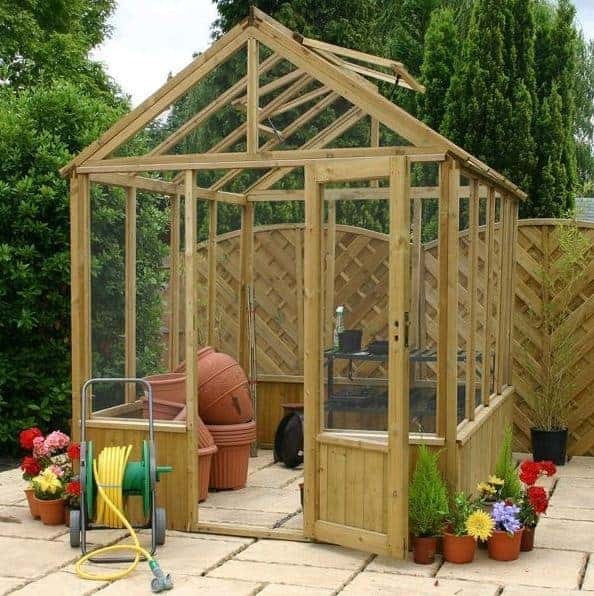 We were struck with this greenhouse from the moment we saw it, and its classic design is probably the most authentically Victorian that we’ve seen, so it’s sure to draw admiring glances to your garden. It’s also very tough and durable, using the best high quality components, which is why it takes the top spot in our league table despite a price of over one and a half thousand pounds for an area of nine foot by six foot. It’s the half boarded design that makes this so obviously a Victorian greenhouse, and with more timber on display than we usually see it’s also very strong and stable even in windy conditions. The boards also provide shade for plants at lower levels while keeping the heat in, and we were pleased to see that top quality tongue and groove cladding had been used, allied to a heavy duty frame. We were even more pleased to find that they had been pressure treated and therefore came with a long 15 year guarantee. Whilst we certainly feel that it can be worth paying a significant amount for a Victorian greenhouse of the very finest quality, as our table topper shows, we also prize value for money highly, and our league table has Victorian styled greenhouses to suit all budgets. 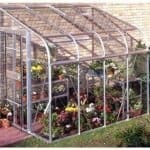 This is demonstrated by this runner up greenhouse, which offers exceptional value for a greenhouse with a base area of twelve foot by six foot. The apex roof gives lots of vertical space as well, with a peak height of 1.97m, so it’s a great and cost effective choice for those people looking for a large and accommodating all weather growing environment for their plants and seedlings. Polycarbonate glazing has been used, which is a cost saving option, but it will still allow a high percentage of light and heat to reach the plants inside. Tongue and groove is used for the frame, however, and we were instantly taken by the attractive appearance it created. It has a symmetry that’s been typical of a Victorian greenhouse for well over a century, and this is epitomised by the wide opening double hinged doors that are centrally positioned and allow easy access in and out, with a wheelbarrow or not. We would have liked to see an extended warranty provided, but with an annual treatment from the customer this should still prove durable. 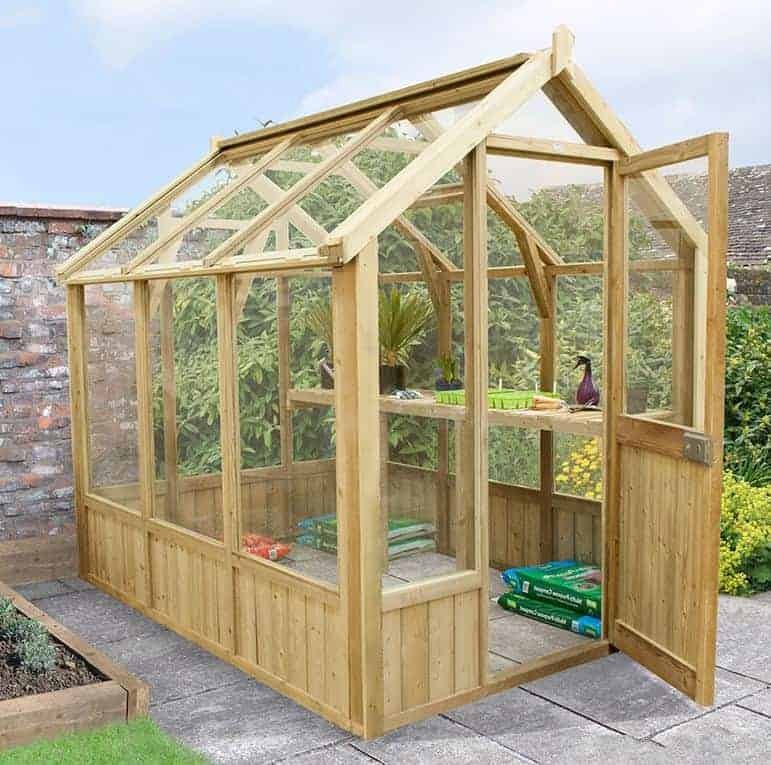 Value for money is the key factor in the Victorian greenhouse sitting in third place in our league table as well, and this six foot by six foot model even provides added value for money by bringing with it a 10 year manufacturer’s guarantee against rot. This is dependent upon the customer adding preservative treatments on an annual basis, but on a relatively compact greenhouse such as this that shouldn’t be too costly or time consuming. 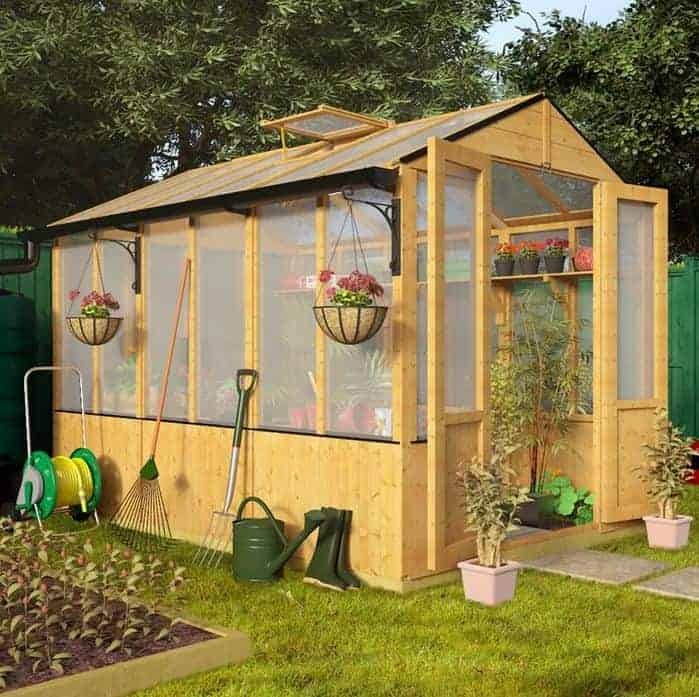 This six foot square base area is in many ways ideal for the amateur gardener looking to purchase their first greenhouse, and of course the price of less than four hundred pound will be particularly attractive to them. Equally attractive to us was the 12mm tongue and groove cladding that gives this Victorian greenhouse its familiar styling. Whilst it hasn’t been given a long lasting pressure treatment, which is understandable at this budget price, we were pleased to find that it had at least been given an initial dip treatment to keep wet rot at bay during its initial phase. It’s also taller than many of the greenhouses of this size that we’ve reviewed, with the apex roof reaching a peak height of 2.10m, making this a good greenhouse for taller plants or for the addition of staging. For a small garden, a greenhouse with a base area of approximately six feet by eight feet can be of ideal dimensions, as it provides a relatively large amount of growing area and yet won’t take too much space away from the lawn itself. Of course, when it’s a well designed Victorian greenhouse as well, such as this one, it adds aesthetic appeal as well as practicality. The timber boards running around the lower reaches of this greenhouse may not extend as far up as some that we’ve seen, but they still add both stability and shade, as well as style. We were pleased to see that high quality tongue and groove cladding had been used throughout, although the glazing which is the dominant and eye catching material in this Victorian greenhouse is made of styrene. Nevertheless, this is tough and shatter resistant which can be invaluable if you have children playing around the building, and we were pleased to find that the roof included two opening vents so that the interior can easily be ventilated on a hot day. 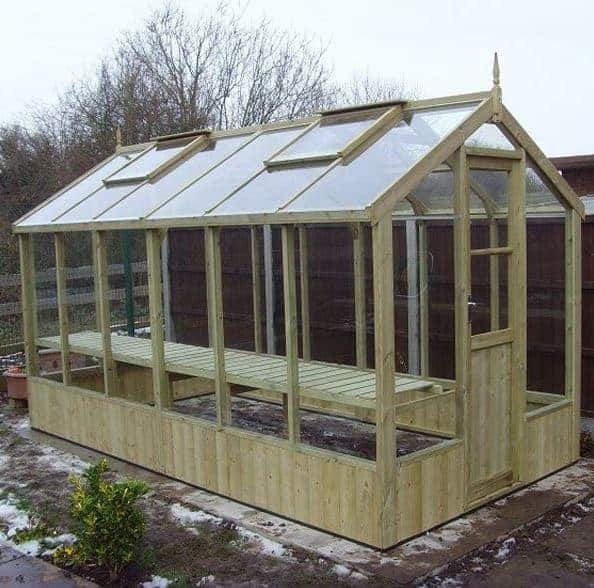 What we liked most about this greenhouse, however, was the fact that all of the timber had been pressure treated, although we would have liked to see this bring a 15 rather than 10 year warranty with it. This is both the smallest and the least expensive Victorian greenhouse in our top fifteen league table, and yet we feel that both of these factors can bring advantages. 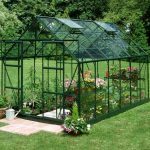 The benefits of the low price of not much more than two hundred pounds are obvious, especially for those who are looking for a starter or supplemental greenhouse on a tight budget. The compact footprint of three foot by six foot can also prove to be very useful for those with a small garden where available space is at a premium. It means that those people too can experience the benefits of being able to protect and grow their plants whatever the weather outside. 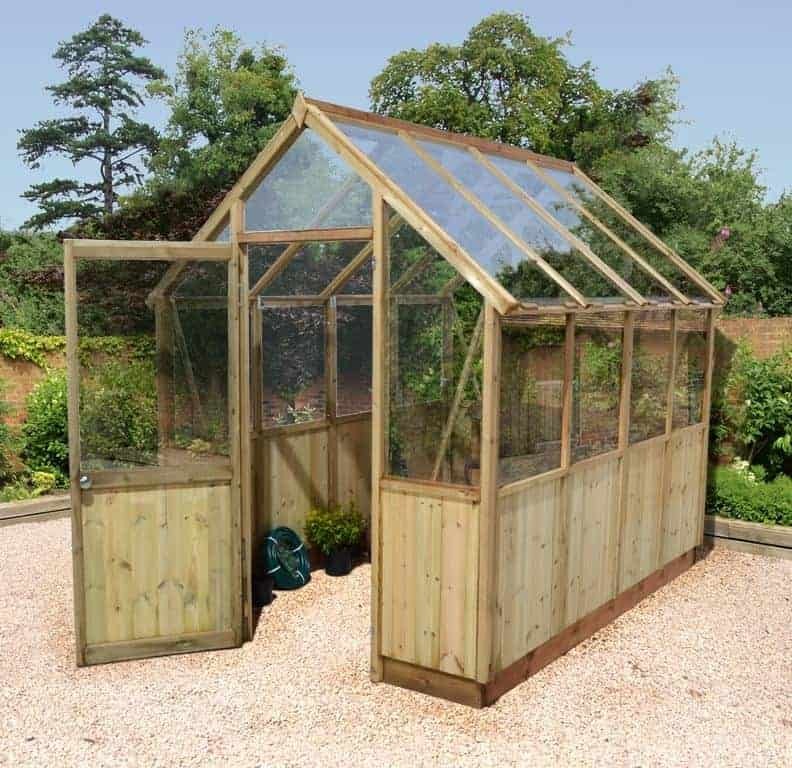 We were pleased to note that despite the low asking price the manufacturer has still adhered to the authentic style of a Victorian greenhouse that we and so many others rate so highly. Indeed it’s compact nature seems to place more emphasis on the smooth planed timbers rather than the tough polycarbonate glazing, so that we found this an eye catching addition to the garden. As you might expect at this size, there is no opening vent in the apex roof, but there are wide opening double doors at the front that can be used for ventilation purposes. 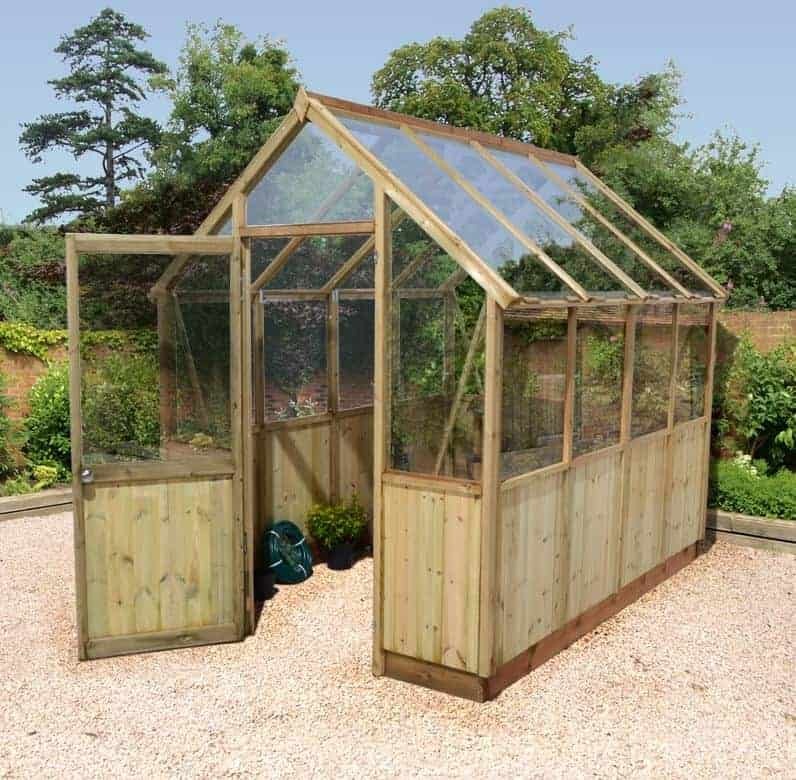 This is the second Victorian greenhouse to feature base dimensions of approximately eight foot by six foot, and it’s only the significantly higher asking price of fifteen hundred pounds that sees it achieve a lower position in our league table. 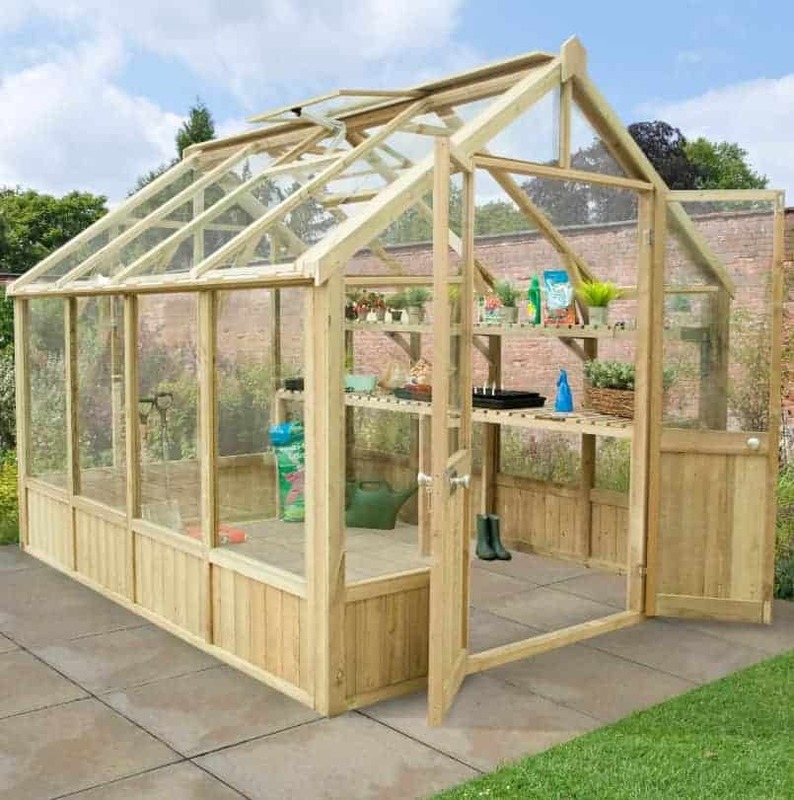 From the moment we saw this greenhouse we knew we were looking at one that used the highest quality components however, and so if you prize elegance and durability above value this could be one to put at or near the very top of your shortlist. The first thing that impressed us was the glazing used, as it consists of toughened glass that at 4mm thick is as strong as any that we’ve seen used on a Victorian greenhouse. It means that it’s virtually shatter proof and yet it also possesses outstanding light and heat transference qualities that will help your plants thrive. At 70 x 45mm the frame too is thicker than any that we’ve seen, and helps make this a very stable and reliable greenhouse. We were also very pleased to see that all of the tongue and groove timbers had been given an initial pressure treatment by the manufacturer, as this long lasting preservative solution means that the greenhouse comes with a 15 year guarantee against wet rot. This is the third BillyOh model to make it into our league table, which is testament to the build quality, reliability, and value of their buildings. It’s certainly not the most elegant Victorian greenhouse that we’ve reviewed, and yet its centrally positioned double doors and widespread use of timber framing and boarding shows that it has taken its inspiration from classic greenhouses of the past. Once the timbers have been treated and painted or stained by the owner, this can still become an attractive garden feature. Where we feel this Victorian greenhouse does score very highly is in the amount of growing space it provides for an asking price of not much more than four hundred pounds. We would have expected to pay much more than that for a base area of nine foot by six foot, even allowing for the use of polycarbonate glazing rather than glass and the lack of an extended warranty. It’s worth noting that it also comes without a base, but this can be added for around seventy pounds which we feel doesn’t detract from the great value offered. We were also pleased to find an opening vent included as standard in the roof, which becomes more important of course the larger a greenhouse is. When we review a Victorian greenhouse from the Grow-Plus Sherbourne range we always expect to find toughness, durability, and quality, and that’s certainly what we discovered with this highly attractive ten foot by eight foot model. It’s only the price of approximately nineteen hundred pounds that prevents it being placed much higher up our league table, and yet it has qualities and components that make it stand out from almost every other Victorian inspired greenhouse we’ve reviewed. Whilst polycarbonate is a cost effective glazing system, and provides a good climate for plants, it can’t match toughened glass in terms of style or performance. That’s why we were pleased to find tough glass used throughout, and you should notice the difference with the performance of your plants inside too. Once again tongue and groove cladding has been used, and you should notice the benefits of the very strong and reliable heavy duty frame used. We were very pleased to find that the timber had not only been given the long lasting protection of pressure treatment, and therefore has the backing of a 15 year warranty period, it has been slow grown and kiln dried. This is something that we only see in wooden greenhouses of the very highest quality, and it gives it exceptional strength, durability, and reliability. As value for money is so important to many people buying a Victorian greenhouse, many of the buildings that make up the second half of our WhatShed league table are of a high quality and yet come with a high price tag attached as well. That isn’t the case here, however, with a four foot by six foot Evesham greenhouse that will be affordable to just about anybody. 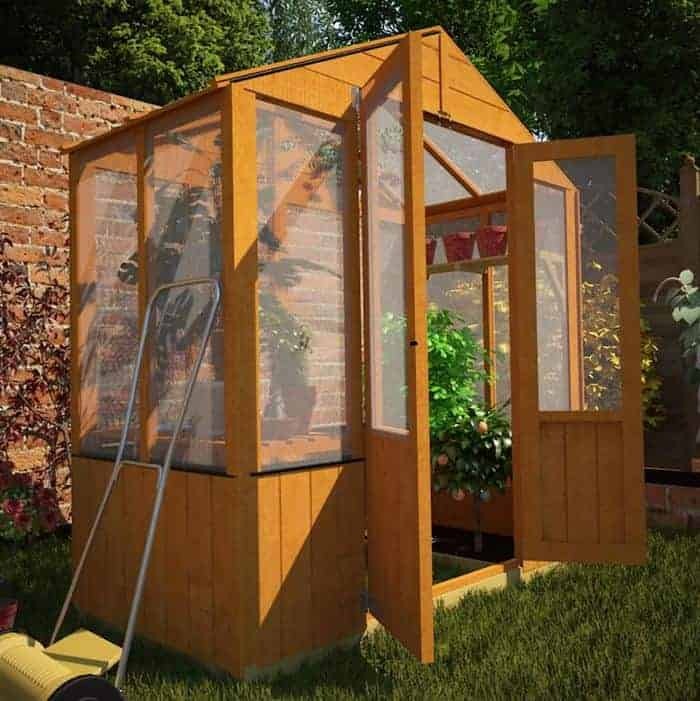 It’s this price tag of less than three hundred pounds for what we found to be a good looking and classically styled glasshouse that sees it earn a place in our top fifteen. We were glad to find that even on a Victorian greenhouse as compact as this, the manufacturer had still included an opening vent in the apex roof which rises to 2.10m. This is good news on a hot day not only for the plants, but for anyone who is inside tending to them. The single door at the front is also a little taller than many that we see on a compact greenhouse, so you shouldn’t have to stoop down too much when walking in and out. Styrene has been used for the glazing, but it’s this that keeps the cost down and makes it so affordable, and at this price we also welcomed a 10 year manufacturer’s anti-rot guarantee. This is the first Victorian greenhouse in our top fifteen league table to come with an asking price of over two thousand pounds. Whilst that doesn’t make it the most expensive model here, it may put it out of the price range of some people, and this has been taken into account when deciding upon its final position in our list. Even so, we do still feel this offers reasonable value for money when you consider the core strength of this buildings, its durability, and its very attractive classic design. Greenhouses are designed to protect the plants within, of course, but with the ever unpredictable British weather it can sometimes be the greenhouse itself that needs protecting. That’s why we were glad to see that this particular Victorian greenhouse had been designed with strength and stability in mind. That’s shown by the use of toughened safety glass, and a strong and thick 45 x 45mm frame. The half boarded design means that there’s more timber on display than usual as well, so it was good to see that they had been protected against the elements by a pressure treatment that brings with it a 15 year guarantee. 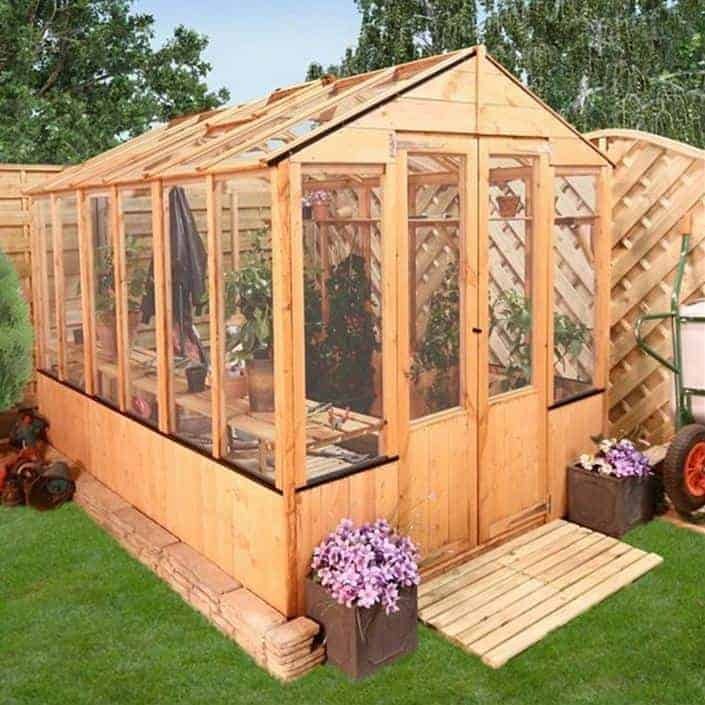 With a key operated lock as standard as well, this could indeed be your ultimate greenhouse if you don’t mind the asking price. This is the largest Victorian greenhouse in our league table, so even though it costs upwards of two thousand pounds we feel it still offers quite good value for money. It has a base area of 2.03 x 4.47m, and the apex roof above achieves a ridge height of 2.37m. 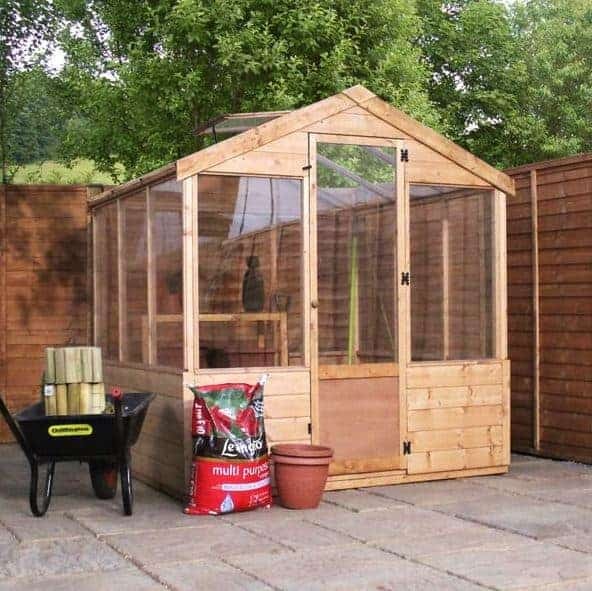 This means that you can fit a very large selection of plants and seedlings inside, making it suitable not only for keen amateur gardeners, but those who are growing plants on a semi-professional basis. There’s full length staging down the side of this greenhouse as well, saving the owner time and money and making it even more convenient. What we liked most about this Victorian greenhouse is that it takes a classic style and combines it with the very latest technology, bringing real advantages to the customer and their plants. We were very impressed, for example, by the use of Thermowood cladding. This means that the timber has not been traditionally pressure treated with chemicals, but has been heat treated instead. It’s a very effective way of keeping rot at bay, as the 10 year warranty shows, without the use of harsh chemical agents. We also liked the way that the four roof vents feature automated mechanical openers, and the way that the PVC base acts as a damp barrier. We were impressed at first sight by this ten foot by eight foot greenhouse, thanks to its classic and well executed combination of glass panels and smooth planed timber. The little things can also make a big difference sometimes, as we found with the inclusion of high quality ironmongery on the double doors. It really catches the eye, and marks this down as a greenhouse of very high quality. The ten foot by eight foot base area of this Victorian greenhouse makes it eminently suitable for mid size gardens, and for people who are looking to take a step up from their previous greenhouse and expand their growing potential. We were pleased to find potting shelves included as standard, as this is something that we don’t always see on a timber greenhouse of this size. We were also pleased to find that there were four vents and all of them automated, so that ventilating the greenhouse on a summer’s day becomes a very quick and easy task. There’s a 15 year guarantee against rot provided as well, showing how effective the initial pressure treatment is, and the only thing preventing us from giving this greenhouse a much higher ranking is its elevated price tag of nearly two and a half thousand pounds. 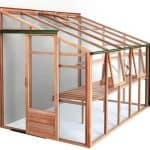 Once again this Victorian greenhouse benefits from the use of Thermowood treated timber. This in turn makes it an ideal choice for more environmentally conscious gardeners, as there are no chemicals used during the process unlike during tanalisation which we more commonly see used. With high quality timber used as well, we wouldn’t be at all surprised to see it last far longer than the ten year warranty period suggests; it’s this slightly restricted warranty period, therefore, and a relatively high asking price for a nine foot by six foot wooden greenhouse that sees it occupy a position in the lower third of our league table rather than nearer the summit where it would otherwise be. One of the many features that impressed us about this Victorian greenhouse is that it has a kerbless floor and wide double doors that open inwards. This means that it’s easy to manoeuvre a wheelbarrow in and out, which is perfect when loading and unloading bags of soil for example. We also liked the use of toughened safety glass throughout, including in the automated vents that integrated into the apex roof. If you want a tough and very attractive greenhouse that won’t harm you carbon footprint, then this could be exactly what you were looking for. This is the only Victorian greenhouse in our WhatShed league table to feature a design radically different to the rest. It eschews the rectangular symmetry and timber boarding more commonly associated with Victorian inspired greenhouses, and instead opts for a visually exciting six sided design. 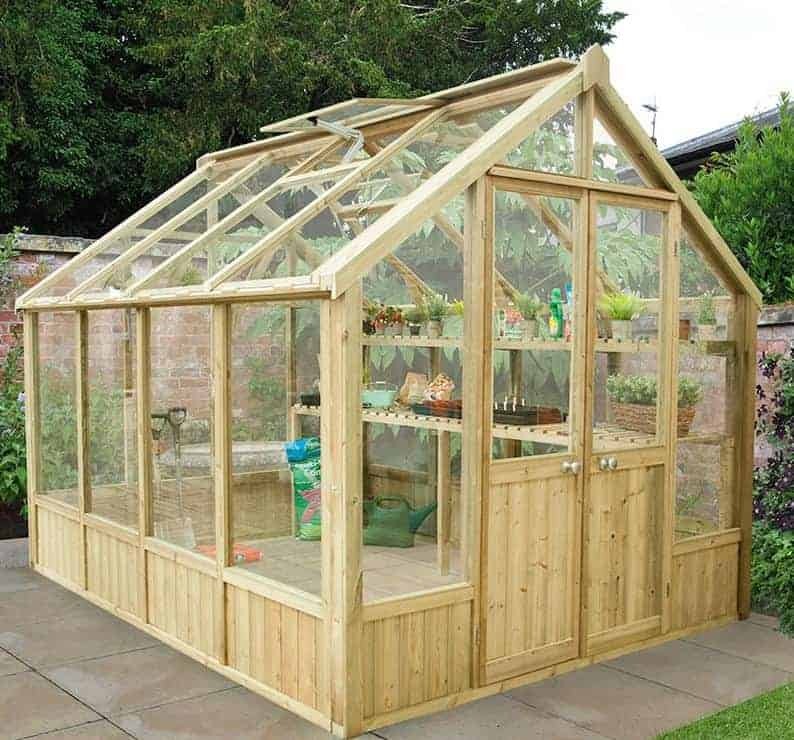 The intricate design features, including a central spike, however give this a look that instantly takes you back to the late nineteenth century, making this one of the most attractive timber greenhouses that we’ve reviewed. The hexagonal shape of this Victorian greenhouse does by necessity take a little away from the interior growing area, due to the cutting of the corners. Nevertheless there is enough space for a good selection of plants, and the profusion of toughened glass should provide very good growing conditions. We were pleased to find that three of these glass panels could be opened, so it’s easy to prevent the plants inside from overheating. We were also pleased to find that all of the high quality timber used had been pressure treated, guaranteeing it against wet rot for at least fifteen years. 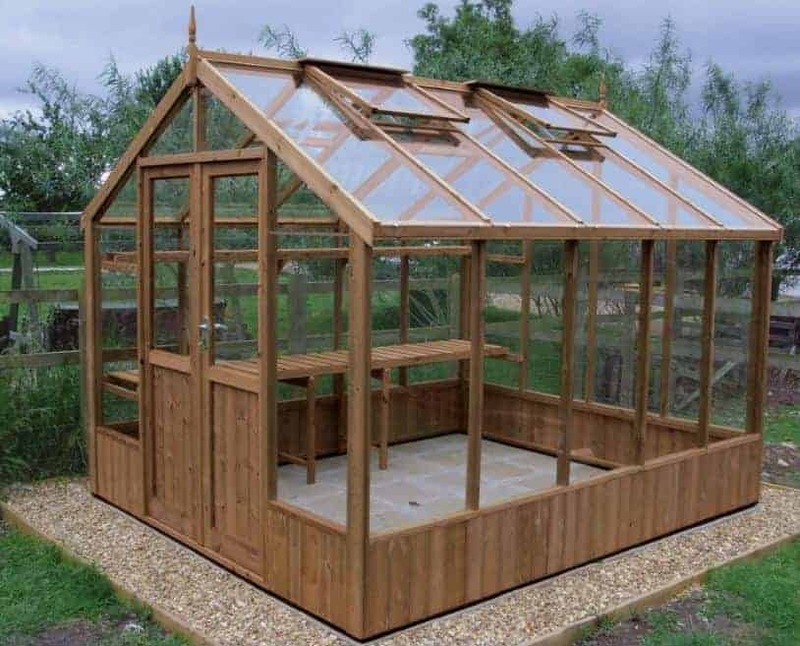 For people who want a very durable and tough wooden greenhouse with a look that’s both original and striking, they could do no better than take a look at this model, even though it’s more expensive than many similarly sized greenhouses. With a base size of 1.60 x 1.93m this is one of the smaller models in our league table of the very best Victorian greenhouses that can be bought online in the UK today. It’s also by far the costliest, with an asking price in excess of three and a half thousand pounds. 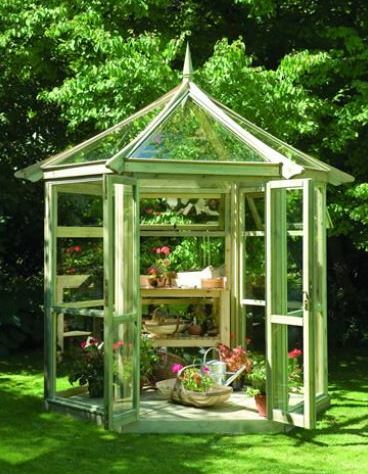 It is also, however, possibly the most authentically styled Victorian greenhouse that we’ve seen, and so will make any garden look more stylish as well as providing a practical all weather area for your plants. It’s this that earns it a place in our top fifteen list, albeit at the foot of it. For what is a relatively small Victorian greenhouse we were impressed by how airy it should be, thanks to two automated vents on the roof as well as two vents on the side panels. 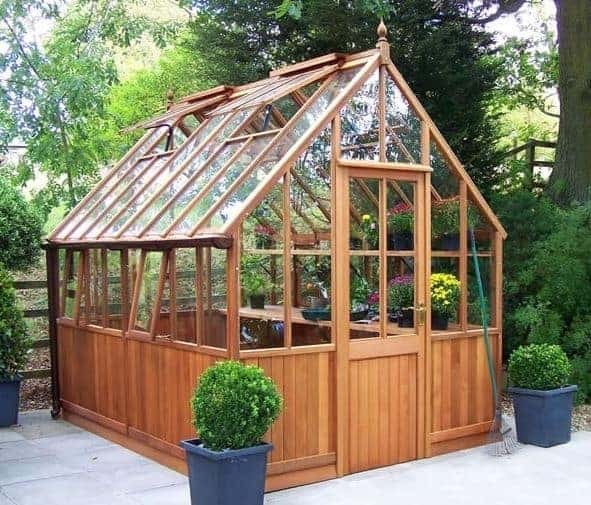 It’s not something we’ve seen on other wooden greenhouses of this size, and the benefits to plants kept within it can be huge. 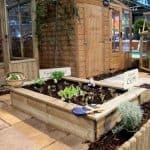 There is also guttering and down pipes included as standard, allowing the owner to collect rainwater which can then be used as a greener way to water plants in the garden or in the greenhouse itself. This is a Victorian greenhouse with a lot to offer then, but we would have liked a lower price and an extended warranty period.